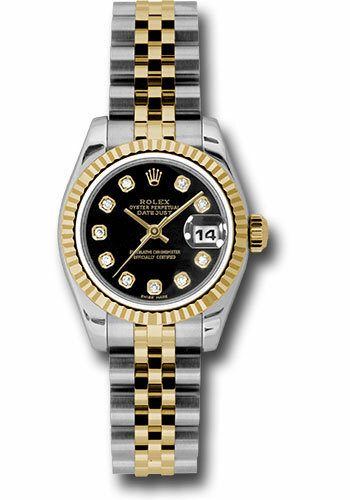 26mm stainless steel case, 18K yellow gold fluted bezel, black dial, diamond hour markers, and stainless steel and 18K yellow gold Jubilee bracelet. 26mm stainless steel case, 18K yellow gold fluted bezel, black jubilee dial, diamond hour markers, and stainless steel and 18K yellow gold Jubilee bracelet. 26mm stainless steel case, 18K yellow gold fluted bezel, black dial, stick hour markers, and stainless steel and 18K yellow gold Jubilee bracelet. 26mm stainless steel case, 18K yellow gold fluted bezel, blue concentric circle dial, Arabic numerals, and stainless steel and 18K yellow gold Jubilee bracelet. 26mm stainless steel case, 18K yellow gold fluted bezel, blue dial, diamond hour markers, and stainless steel and 18K yellow gold Jubilee bracelet. 26mm stainless steel case, 18K yellow gold fluted bezel, blue dial, stick hour markers, and stainless steel and 18K yellow gold Jubilee bracelet. 26mm stainless steel case, 18K yellow gold fluted bezel, champagne dial, Arabic numerals, and stainless steel and 18K yellow gold Jubilee bracelet. 26mm stainless steel case, 18K yellow gold fluted bezel, champagne concentric circle dial, Arabic numerals, and stainless steel and 18K yellow gold Jubilee bracelet. 26mm stainless steel case, 18K yellow gold fluted bezel, champagne dial, diamond hour markers, and stainless steel and 18K yellow gold Jubilee bracelet. 26mm stainless steel case, 18K yellow gold fluted bezel, champagne goldust mother of pearl dial, Arabic numerals, two diamond hour markers, and stainless steel and 18K yellow gold Jubilee bracelet. 26mm stainless steel case, 18K yellow gold fluted bezel, champagne goldust mother of pearl dial, diamond hour markers, and stainless steel and 18K yellow gold Jubilee bracelet. 26mm stainless steel case, 18K yellow gold fluted bezel, champagne Jubilee dial, diamond hour markers, and stainless steel and 18K yellow gold Jubilee bracelet. 26mm stainless steel case, 18K yellow gold fluted bezel, champagne mother of pearl decorated dial, Roman numerals, and stainless steel and 18K yellow gold Jubilee bracelet. 26mm stainless steel case, 18K yellow gold fluted bezel, champagne dial, stick hour markers, and stainless steel and 18K yellow gold Jubilee bracelet. 26mm stainless steel case, 18K yellow gold fluted bezel, dark mother of pearl dial, diamond hour markers, and stainless steel and 18K yellow gold Jubilee bracelet. 26mm stainless steel case, 18K yellow gold fluted bezel, dark mother of pearl dial, Roman numerals, and stainless steel and 18K yellow gold Jubilee bracelet. 26mm stainless steel case, 18K yellow gold fluted bezel, slate grey dial, Roman numerals, and stainless steel and 18K yellow gold Jubilee bracelet. 26mm stainless steel case, 18K yellow gold fluted bezel, ivory jubilee dial, Arabic numerals, and stainless steel and 18K yellow gold Jubilee bracelet. 26mm stainless steel case, 18K yellow gold fluted bezel, ivory pyramid dial, Roman numerals, and stainless steel and 18K yellow gold Jubilee bracelet. 26mm stainless steel case, 18K yellow gold fluted bezel, mother of pearl dial, diamond hour markers, and stainless steel and 18K yellow gold Jubilee bracelet. 26mm stainless steel case, 18K yellow gold fluted bezel, mother of pearl diamond Roman VI dial, Roman numerals with 11 diamonds set on VI, and stainless steel and 18K yellow gold Jubilee bracelet. 26mm stainless steel case, 18K yellow gold fluted bezel, mother of pearl dial, Roman numerals, and stainless steel and 18K yellow gold Jubilee bracelet. 26mm stainless steel case, 18K yellow gold fluted bezel, meteorite dial, diamond hour markers, and stainless steel and 18K yellow gold Jubilee bracelet. 26mm stainless steel case, 18K yellow gold fluted bezel, silver concentric circle dial, Arabic numerals, and stainless steel and 18K yellow gold Jubilee bracelet. 26mm stainless steel case, 18K yellow gold fluted bezel, silver dial, diamond hour markers, and stainless steel and 18K yellow gold Jubilee bracelet. 26mm stainless steel case, 18K yellow gold fluted bezel, silver Jubilee dial, diamond hour markers, and stainless steel and 18K yellow gold Jubilee bracelet. 26mm stainless steel case, 18K yellow gold fluted bezel, silver dial, stick hour markers, and stainless steel and 18K yellow gold Jubilee bracelet. 26mm stainless steel case, 18K yellow gold fluted bezel, white dial, Arabic six and nine numerals set with diamonds, and stainless steel and 18K yellow gold Jubilee bracelet. 26mm stainless steel case, 18K yellow gold fluted bezel, white dial, Arabic numerals, and stainless steel and 18K yellow gold Jubilee bracelet. 26mm stainless steel case, 18K yellow gold fluted bezel, white dial, diamond hour markers, and stainless steel and 18K yellow gold Jubilee bracelet. 26mm stainless steel case, 18K yellow gold fluted bezel, white dial, Roman numerals, and stainless steel and 18K yellow gold Jubilee bracelet. 26mm stainless steel case, 18K yellow gold fluted bezel, white dial, stick hour markers, and stainless steel and 18K yellow gold Jubilee bracelet. 26mm stainless steel case, 18K yellow gold fluted bezel, yellow gold crystal dial, diamond hour markers, and stainless steel and 18K yellow gold Jubilee bracelet. 26mm stainless steel case, 18K yellow gold fluted bezel, yellow gold and grey Jubilee pattern crystal dial, diamond hour markers, and stainless steel and 18K yellow gold Jubilee bracelet.